To drive through parts of the Sierra Nevada these days is to witness a morbid reminder of California's extreme drought: Vast landscapes of standing dead trees, a brown tide sweeping across the green landscape. It's more than eerie; it's a dangerously combustible situation, argues a new publication from Berkeley fire scientists. "If our society doesn't like the outcomes from recent fires and extensive drought-induced tree mortality in Sierra forests, then we collectively need to move beyond the status quo," said study co-author Scott Stephens, professor of fire science at Berkeley. "Working to increase the pace and scale of beneficial fire and mechanical treatments rather than focusing on continued fire suppression would be an important step forward." Future wildfire hazard following this mortality can be generally characterized by increased surface fire intensity in the short- to intermediate-term. 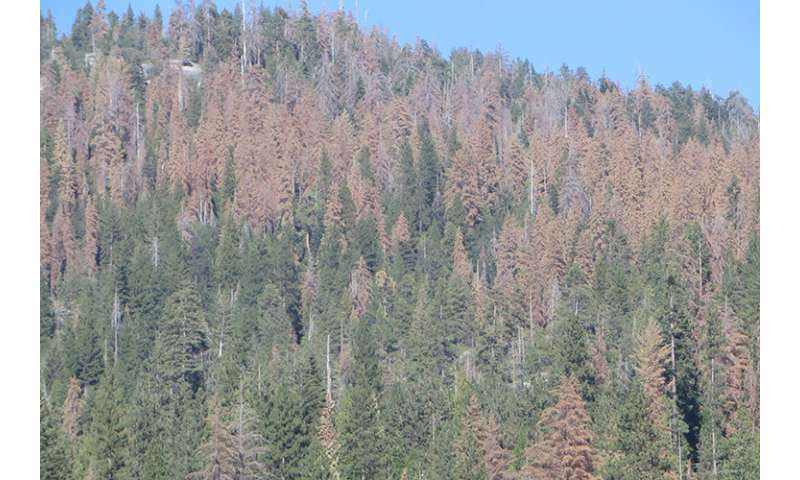 That's because many of the trees killed by bark beetles are the largest trees and not the trees that would be preferentially killed by low-moderate-severity wildfires or targeted for removal in restoration projects. Also, bark beetle-killed trees are often not removed, as is commonly the case in restoration projects involving mechanical thinning or in forests subject to centuries of frequent fires. So tree biomass remains on site as potential fuel for fires. "Tree mortality at the levels we've observed in the central and southern Sierra Nevada sets the stage for potential fire activity that is well beyond what we can predict with our current operational fire-behavior models," said Brandon Collins, a research scientist at the Berkeley Center for Fire Research and Outreach, and a co-author of the study. "This heightened fire potential is even more daunting when you consider how much total area has already experienced high levels of tree mortality."